Hello my darlings!! This week has been filled with activities and lots of meetings and I've been so busy, I haven't had a chance to put together a new look. However, in honor of Throwback Thursday aka #TBT, I'm bringing back an oldie, but a goodie, just in time for the summer and the annual Coney Island mermaid parade for all my NY peeps. 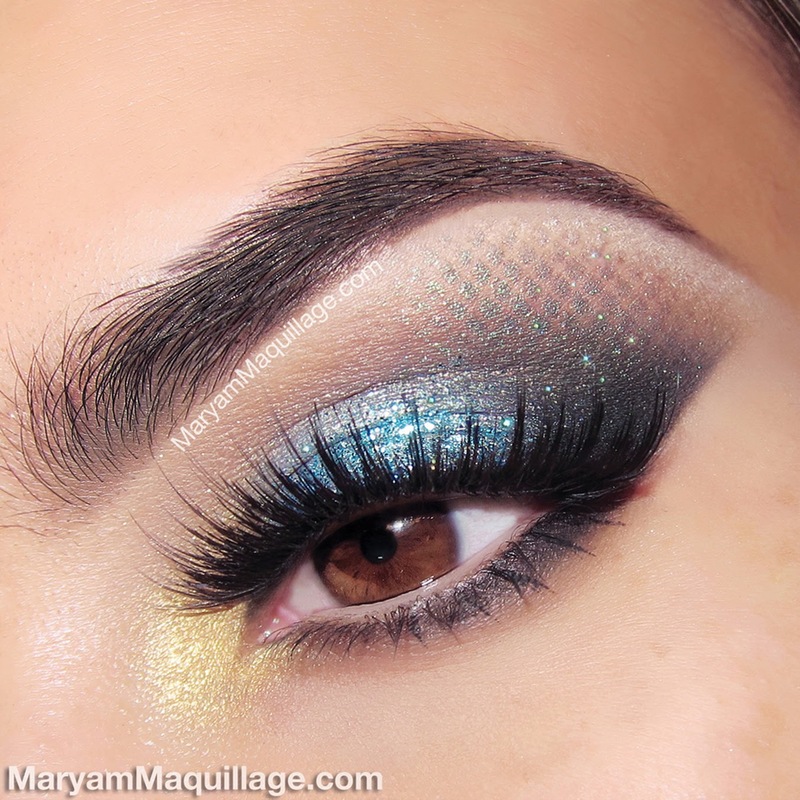 This look is part wearable part fantasy and it's sure to turn the heads of all makeup freaks and mermaid fanatics. Plus, it's easier than in looks!! I'm using all Motives Cosmetics (listed & linked below) & 15-piece professional brush set. My lashes are House of Lashes "Noir Fairy" lashes. Prime the lids from the lashes to the brows using Motives Eye Base. With the angle liner 207 brush, line the top and bottom lash lines with Motives gel liner in Little Black Dress, wing out the outer edge and smudge the top liner up towards the crease. With the detailing 229 brush, apply a thin layer of Motives Cream Shadow in Gold Dust all over the lid and inner corner. Layer the shadow over the smudged liner. Using the pointed crease 204 brush, apply Onyx eyeshadow to the lower lash line, outer corner and outer crease of the eye. Blend out any harsh edges using Cappuccino eyeshadow. Using the 130 concealer brush, apply Gold Rush eyeshadow to the inner corner (combined with the Gold Dust eye base, the resulting color is a bright, popping yellow gold). Clean off the brush and apply Crystal Blue eyeshadow to the center of the lid, blending the transitions. Cut off a small piece of an old fishnet stocking to use it as a stencil for the "scales" pattern. Hold the fabric taught, but don't stretch it -- stretching the fishnet would result in a larger pattern. Using a slightly damp eyeshadow brush and a sparkly turquoise loose shadow (Motives Mineral Eye Shadow in InStyle), layer the shadow over the fishnet in the outer brow bone area. This takes a bit of practice and patience -- you only get one shot to apply the scales, so make sure not to move the fabric until you are completely finished. 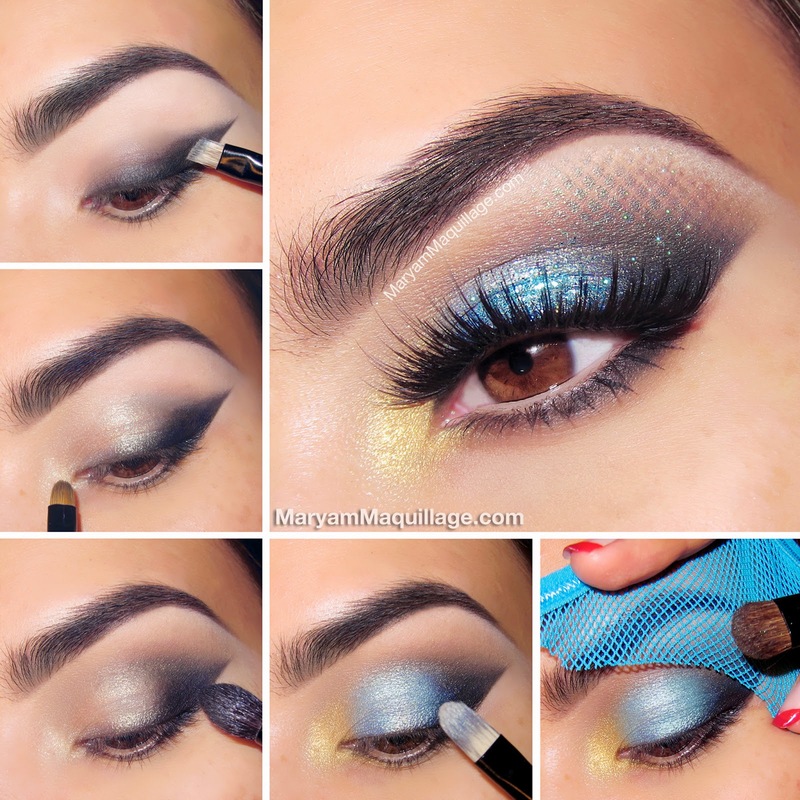 Increase the sparkle by adding Motives Glitter Pot in Lagoon Blue on top of the lid shadow. Add voluminous false lashes and skip the liner. My lashes: House of Lashes "Noir Fairy"
Parabens! Todas maquiagem muito perfeitas. omg is so pretty!!! Thanks for sharing this with us! Love that scale effect. So that's the way to do it. You are a pro!